This three-part series by Aidan Craney, PhD candidate at La Trobe University, examines the different perspectives towards finances of people in donor and recipient countries. It looks at current debates about how to improve the efficiency of donor dollars and how to assist poor people in less-developed states to escape extreme poverty. To open up the discussion, I will look at a paper from Joseph Henrich, which examines the different responses cultures worldwide provide when faced with the prospect of controlling the distribution of a nominated amount of money between themself and one other person. The article, ‘Does Culture Matter in Economic Behavior? Ultimatum Game Bargaining Among the Machiguenga of the Peruvian Amazon’ (here’s an easier to digest version), provides an insight not only into whether or not the concept of economic rationality is consistent globally, but also into the nature of obligation when providing and receiving gifts. 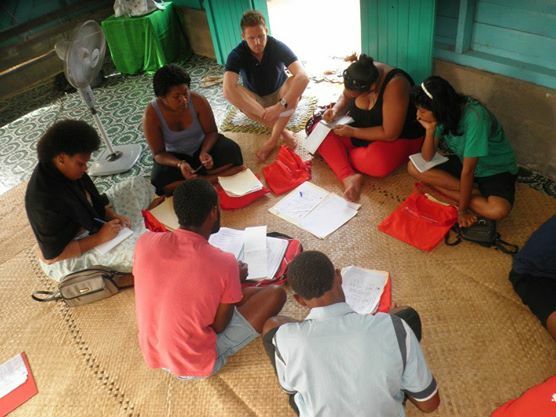 Image: Aidan Craney with Fijian youths during microenterprise training. The premise of the Ultimatum Game is simple – one person is offered a nominated amount of money (‘large relative to… the subjects’ socioeconomic status’) and told to share it with one other, anonymous, pre-selected person. The giver decides on the split and if the receiver agrees with the offer, each is allowed to keep the amount agreed upon. If an agreement is not reached, the money goes begging. Industrial societies typically display behaviour where a split of between 40%-60% is offered, with most offers above 20% accepted. Offers of less than 20%, however, are typically refused. This isn’t the typical behaviour expected of homo oeconomicus, where ‘economic rationality’ would dictate that any profit should be accepted. Even accepting refusal behaviour as an act of homo ludens, however, a trend is apparent that some equity needs to be displayed in the transaction. Until the work of Henrich, amongst others, it was assumed that this level of rationality in the Ultimatum Game was universal at high stakes. What Henrich found, instead, is that the amounts offered and accepted vary wildly from culture to culture. The Machiguenga of Peru offer paltry amounts compared to participants from LA to Jerusalem to Tokyo. Further, Henrich states that in some cultures refusal increases in line with increased offers, theorising that accepting such offers would lead to future obligations of receiver to giver. So what does this say about donor behaviour? For decades anthropologists have debated Maussian theories of the triumvirate of obligations in gifting; being to give, to receive and to reciprocate. When looking at donor behaviour, then, we must ask ourselves what the donor is obligating the recipient to; whether the recipient and donor share an understanding of appropriate reciprocation; and at what point does either party lose agency in their ability to give, to receive, to reciprocate or to refuse. Previous Previous post: Innovation: transactional or transformative?